Galette is such a festive, pretty word. It is a French word, so for me it immediately elevates a dish to a certain level of sophistication. Yet a galette is a rustic dish, not fancy or intricate. I like to think that serving a galette evokes an atmosphere of rustic elegance. Sometimes it feels good to make something that feels special, but that’s very practical and healthy at the same time. Galettes can be sweet or savory, and there are endless variations one can create with the filling. The recipe I am sharing here is based on one I found in the current issue of Real Simple magazine, though I made some changes to it to suit my family’s tastes. The roasted broccoli mixed with the creamy melted Feta gives the filling such a delicious flavor, and the hearty wrap-around crust turns it into a meal. I like to make my own crust for a galette, and it is basically the same as a pie crust. If you are looking for a good pie crust recipe, I posted one last spring and you can click on the above pie crust recipe link to find it. (That recipe is for a double crust, and a galette needs only a single crust, so I like to refrigerate or freeze the dough for the second crust to use in the future–making the next galette just got even easier!) If you are short on time, or if you just don’t enjoy making pie crusts, you can also use a store-bought pie crust. Basically, all you have to do for this recipe is prepare the crust, chop and saute the vegetables, add the cheeses, and assemble the galette. While it is baking, you have time to make a salad or another side dish if you wish. We have had some pretty rushed dinners these last couple of weeks, due to our busy spring schedule. When I made this galette yesterday, it felt good to put a little extra effort into choosing the meal and making it. It felt good to put some joy back into the meal-making process, and that joy transferred to those eating the meal. Though we were still somewhat rushed to get to soccer practice after dinner, there was a sacred bubble of time when my husband, kids, and I were all together in the kitchen and dining room, enjoying our food in an atmosphere of comfort and rustic elegance. Happy May Day, I hope you all have a great weekend! If you are making your own crust, mix up the dough. Preheat your oven to 400 degrees Fahrenheit. Heat the olive oil over medium heat in a large skillet or pot. Add the onions and 1/4 teaspoon of salt and 1/4 teaspoon of pepper. Cook the onions, stirring now and then, until they are soft and golden, about 7 or so minutes. Add the broccoli and half of the Feta and stir to combine. While the onions are cooking, roll out the pie crust into a circle about 14 inches in diameter. (I roll my pie crusts out on floured wax paper–they stick less and are easier to transfer that way). Roll the crust back onto the rolling pin and gently transfer it to a baking sheet lined with parchment paper. Spread the minced garlic and Parmesan cheese evenly onto the pie crust, leaving a 2 inch border around the edges. Then spoon the broccoli mixture onto the pie crust, keeping the same border. Gently fold the edges of the pie crust over toward the center, pleating and folding all the way around, covering the filling by about an inch. Sprinkle the remaining Feta on top of the filling. Bake in the oven about 30 minutes, or until the galette is golden brown. Serve with a green salad or another side dish. Enjoy! This recipe is based on one found in the May 2015 issue of Real Simple magazine. The pasta recipe I have posted below is one of the meals I make again and again. I think of it as one of my workhorse meals. Not only is it a crowd-pleaser, but it is relatively easy to prepare, full of vitamins and protein, and filling without being heavy. One of my favorite aspects (besides that is tastes delicious) is that it does not have a lot of components and it does not require a lot of dishes! And with fall broccoli becoming ready to harvest, it is a great way to use broccoli. 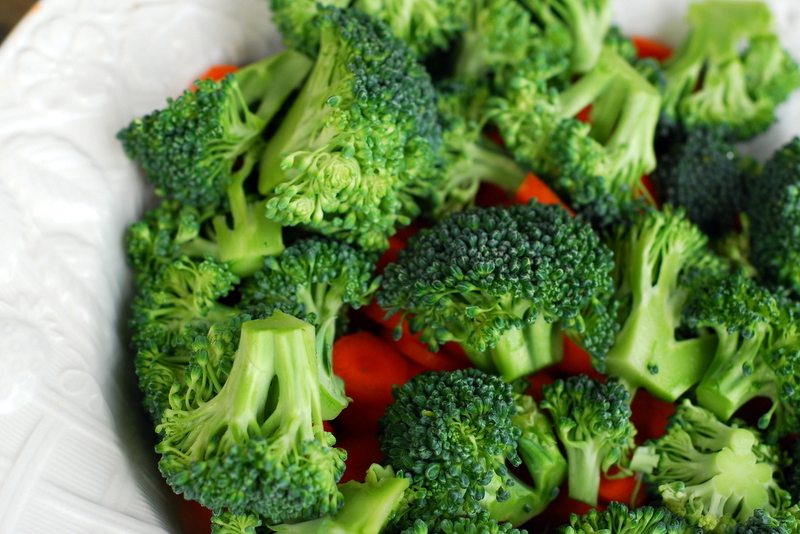 Both broccoli and carrots are full of vitamins and minerals like vitamins A and C, beta carotene, calcium, iron, and potassium. 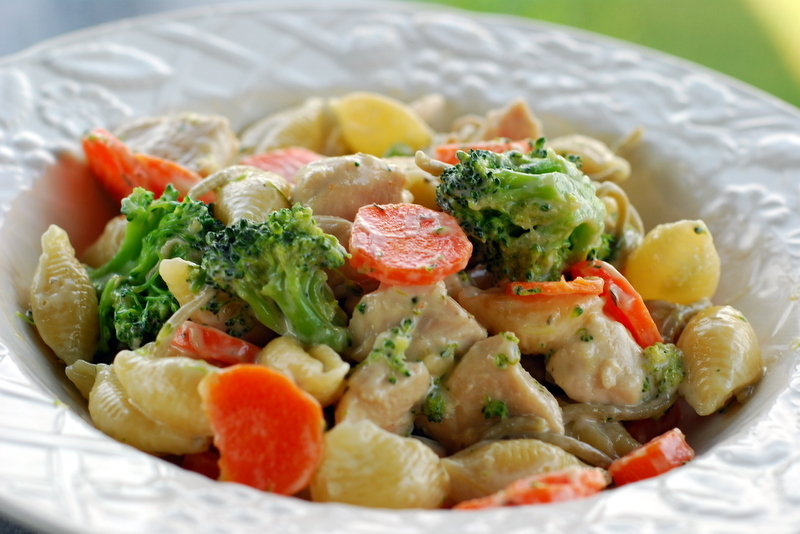 The chicken provides protein and the pasta gives it substance and that comfort-food feeling. There is something about a warm pasta meal that soothes and cheers many a weary soul. 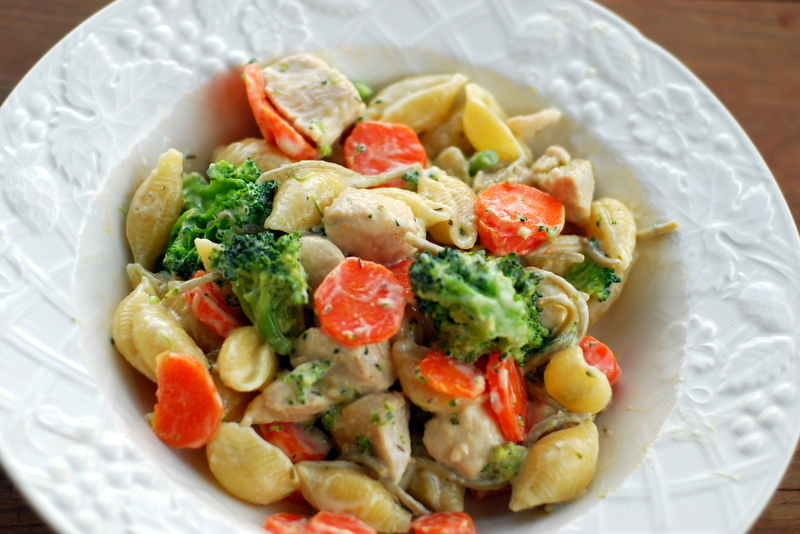 I have used whole wheat pasta and traditional pasta, and the dish tastes great with either, though it works best with the shorter pasta like penne or rigatoni–spaghetti makes it more difficult to mix with the vegetables. I try to use chicken that is either organic or at least raised humanely and fed high-quality feed. It costs more to buy meat like this, but since we do not eat meat every day, it works out. The Ranch dressing gives the dish a yummy flavor and keeps it moist without making it heavy. With the nights getting consistently cooler and darker earlier, it is comforting to have a warm, steaming meal at the end of the day. You can serve this meal with bread and/or a tossed salad if you want, but it can stand alone if you want to really keep things simple.